Manufacturers of machinery for the production of biodiesel and filtration of vegetable oil.  A new biodiesel enterprise in Widnes has set up a TT700A with the enhanced processing features talked about on this VIDEO. Basically Batches are produced one after another every two hours, and pumped into auxiliary settling tanks for settling out the glycerol. 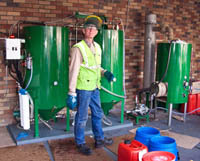 Several thousand litres of crude biodiesel are produced each day and left to stand for 3 days, after which they are reintroduced into the main machine for purification. Total capacity for the TT700A is increased to about 1,200 litres per day (8 hours work) rather than 665 litres in 5 days using the machine as a standalone unit (EN14214 achieved).  Fuller Fuels built and plumbed in the distribution pipe work themselves, saving an estimated £3,000 on labour costs and soon got to grips with the electric threading machine even though they had never done this sort of work before. There was only one leak on the several hundred joints!  The Bute recycling centre, Rothesay, have recently upgraded from a TT150 to the air operated TT400A machine. They also now have a methanol recovery machine (far right) for reclaiming methanol from the glycerol bi product that would otherwise be wasted.  We have now moved into our new workshop in Bangor, N.Wales, where we are already working on processors to be delivered to Scotland.  Popular amongst small businesses as a pilot plant, the TT700A is the best value for money of the range. This machine has been loaded onto a trailer and is now on it's way to Cyprus where it will be processing waste vegetable oil..
 The TT400A. Big brother to the 150MK2, it will produce 400 litres of high quality biodiesel per batch. Ideal for businesses as it conforms to safety regulations so that employees can safely and legally work on the machine AND the larger size means more litres per hour's wages. Hands on time is still 5 hours. Available in single or 3 phase (30 amp supply). A compressor is required for operating the main pump (no hand pump).  The Twyn Tub concept is proving itself to be popular amongst customers requiring a safe and long lasting biodiesel processor for small scale use. Now in it's Twyn Tub 150 MK2 form, the machine is a fully comprehensive vegetable oil to biodiesel processor and will even pre-process waste vegetable oil from pubs, restaurants and cafes, with filtration systems for both oil and biodiesel and de-waxing capability.  Featuring interviews with some of the main players in the grassroots biodiesel and SVO industry, this DVD gives a valuable insight into the realities of running a small scale biodiesel plant, running a biodiesel forecourt, converting modern engines to run on SVO, the ethics of fuel crop production, funding a biodiesel project and pressing pure plant oil. 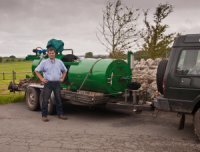 A complete trip around the UK in a vehicle run on waste vegetable oil. Make sure that you watch this DVD before embarking on any biodiesel project, ESSENTIAL VIEWING, it could save you a fortune. About 3.5 hours of PAL DVD video on two discs, plus xtras. Watch the short trailer: Trailer or find it on the products page.  Goat industries has launched a new service, telephone consultancy, which enables amateurs and professional to get useful information on vegetable oil and biodiesel.  The Koldrõn technology can now be licensed to companies wanting to build their own machines. This is often more practical than transporting the machine from the UK and there are likely to be savings in manufacturing costs compared to the UK. 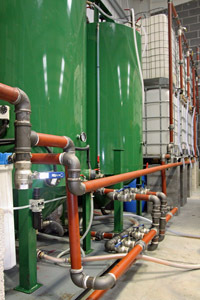 See machinery for producing biodiesel for more information.  Full plans for building the filter separator 500 machine are now available on the products page. This machine will filter waste vegetable oil and remove the wax through an ingenious 4 stage process.  Stephan Helsbig's new book 'The edge of veg' is highly recommended for anybody wanting to use straight vegetable oil in their vehicle. It can be bought from amazon.de for just 16.20 euros, if you can translate the german on the web site that is! The book itself is written in english. Other books are also now available on the products page.  Goat industries has launched a new product, the Filter - separator 500, which will purify waste cooking oil, removing the solids, waxes and fine particles to produce fuel for use in certain diesel engines. Not all engines are compatible with using veg oil, so check the rest of this site for more information, especially the fuels database.  The heat exchanger based conversion kits have now been replaced with a much simpler system in the belief that heating the oil is not as essential as originally thought. We now believe that heating of the oil is unnecessary, as long as it is liquid, and advocate either using the oil direct in the fuel tank or using a two tank system with the switch over valves that we supply. The theory is that the temperature of the fuel leaving the injector pump is solely dependant on the temperature of the injector pump itself, so that when the engine is hot the heat conducted from the engine to the pump warms up the oil that passes through it. The fuel itself passes so slowly through the pump that it does not cool the pump down even if it is cold itself. Goat industries is mostly involved in the production of machinery for producing biodiesel, which is commonly blended with normal diesel at a ratio of 5%. Higher blends can be used and this is dependent on the ambient temperatures and the type of vehicle. As with using relatively unrefined vegetable oil, care is needed using biodiesel as it is not, at present, as 'high tech' as the ultra low sulphur diesel hat we buy at the pump. The petrochemical industry has spent millions and millions of pounds/dollars on research into diesel fuel and they have managed to turn diesel that used to freeze in the fuel tank into the high tech product that we know take for granted. As relatively small scale operations we are still able to undertake useful research and with the power of the internet can network with each other relatively easily. 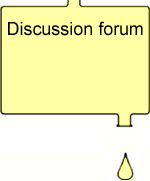 Goat industries is keen to promote the free exchange of information by hosting discussion boards and databases for the benefit of fellow enthusiasts and the planet in general. We are, however, a normal profit making company and at present we sponsor this web site through biodiesel plant production contracts. This is a photo of Paddy, the main man in goat industries, holding up a sample of his biodiesel, though it could easily be mistaken for something else by the colour!